Eaton Brook Reservoir is a small Y-shaped water body located in Madison County near the Hamlet of West Eaton. It is one of the numerous area reservoirs that was built to supply water to the Erie canal. Physical Features: Elevation: 1400 feet Area: 272 acres Shoreline Length: 4.9 miles Length: 1.65 miles Maximum Depth: 50 feet Towns: Nelson, Eaton Aquatic Plant Life: Rooted aquatic vegetation can be found around the shore of most of the lake out to about 15 feet of water. The area south of the causeway and it's western arm have significant plant growth. Access: Off Eaton Brook Road (County Route 52), 2 miles east of the hamlet of West Eaton. Concrete ramp. Parking for 13 cars and trailers. Fish Species: Largemouth bass, smallmouth bass, walleye, rainbow trout, chain pickerel, black crappie, pumpkinseed sunfish, bluegill, rock bass, yellow perch, white sucker, golden shiner and brown bullhead. 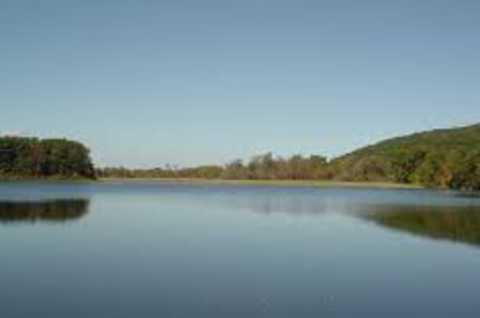 Fishing: Eaton Brook Reservoir is fairly steep sided, with deep water often only a short distance from shore in some areas. This, coupled with the very clear water, can often make fishing challenging. Most anglers target the rainbow trout shortly after they're stocked in the spring but some hold-over fish are taken most winters by anglers ice fishing the reservoir. Walleye can often be difficult to catch, but when a lucky angler gets one, it's usually a nice sized one in the 20+ inch range. Largemouth bass are more abundant than smallmouth with fish in the 13 to 15 inch range common for both species. Chain pickerel are abundant, though most hover around the legal length of 15 inches. Fisheries Management: Eaton Brook is stocked yearly with approximately 2,000 yearling rainbow trout and between 760,000 and 1.3 million walleye fry.